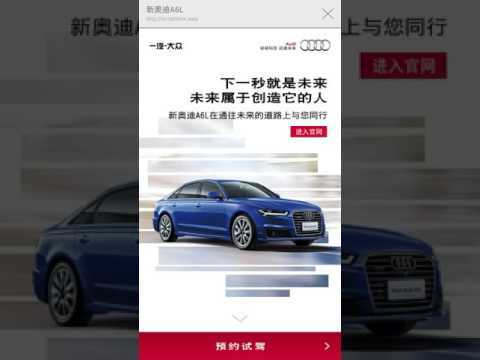 Given the complex mobile ad landscape in mainland China, Audi expected an innovative and effective ad delivery on quality mobile publishers for A6L to not only draw attention from its usual group of high-end target audience but also arouse interest in the younger, up-and-coming groups. The practice of forced pre-roll video ad format has been adversely impacting user experience in the market on the other hand, it is hence also important to ensure the new Audi A6L campaign would appeal to its target audiences positively. Audi also needed a multi-dimensional analysis of the campaign’s result, impact and value. iClick Interactive optimized ad exposure in the mobile environment for Audi A6L and ensured the ad’s outreach to the brand’s core target audience via its platform’s programmatic buying. Using our MoTV solution, the campaign also adopted a mix of Open Splash and In-Feeds ad formats to enhance user engagement. To optimize campaign result, a basket of premium news media were strategically covered to further enhance brand image for Audi A6L among the premium target audience group. Fashion and lifestyle media were included to ensure an effective outreach to the younger group with high consumption potential. A specifically designed HTML5 landing site was also in place to promote in-depth interaction with and conversion of the target users reached. In 14 days, 43M+ unique mobile users were reached via the campaign, with 70% of the core automobile spenders reached.